Willy, UA9BA, has posted a brief article about his 160m antenna. Therein, he compares his 160m signal to those of RG9A, R8TT and UN7LZ in this year's CQ 160m contest. Unfortunately, the graphs he presents are impossible to interpret quantitatively and with statistically meaningful confidence limits, a situation exacerbated by the RBN's unique use of the term SNR. 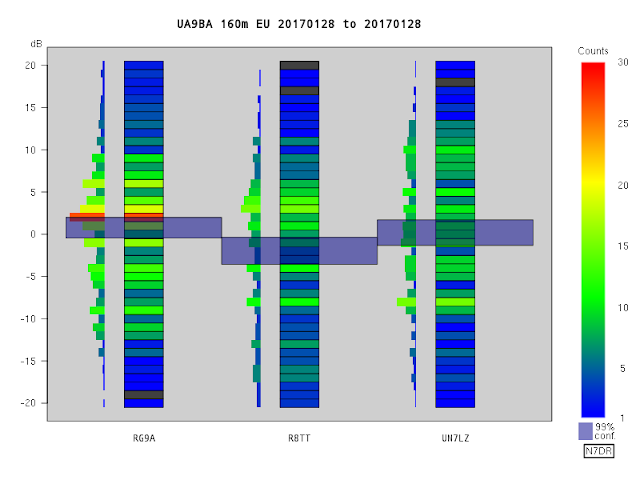 This tells us immediately that, for the periods in which UA9BA and one of the other stations could be heard by the European portion of the RBN, there is no evidence that there was a substantive difference between the signals from UA9BA and RG9A or between the signals from UA9BA and UN7LZ. We can, however, be 99% certain that UA9BA was stronger than R8TT in Europe, with a signal difference of a few dB. I note that although Willy refers to the other station as his "local rivals", they are actually rather distant from him, and (if the maps on qrz.com are correct) the stations are actually considerably closer to Europe, which, of course, makes his signal even more impressive. NB: The graphs in Willy's post show that there are periods when not all the stations generated posts at a given RBN receiver. This is hardly surprising, given the relatively large separation of the stations and the nature of propagation on 160m. A statistically meaningful signal comparison requires enough pairwise measurements be made at about the same time so that a statistical analysis with usefully narrow 99% confidence limits can be performed.